Review - February 2018. Having picked up the "Costuming" license from Disney/Lucasfilm, Anovos has gone on and produced some pretty impressive helmets and costumes. Sometimes it seems their Customer Service has not been able to keep up with the deluges of new items - but it's pleasing that they are putting some real quality items out. We're not sure where the Force Awaken Rey helmet fits in Anovos' Standard/Premier line ranges, but seems to occupy the middle ground. Nevertheless its an really great looking helmet that replicates pretty well the one Rey has in the early scenes of the film on Jakku - although we understand that the Anovos helmet itself derives from the X-Wing helmets used in the subsequently released "Rogue One" film - but that's not necessarily a big issue. So in comparison with the fairly recent EFX range of W-Wing helmets, the Anovos Rey has if anything a more impressive paint/weathering finish - and that's no mean feat. We've done some comparison shots lower down but its a slightly smaller and certainly lighter helmet than the EFX X-Wing range (ANH Luke, ESB Luke and ANH Wedge). Weight-wise the difference due to the EFX's fiberglass construction, whereas the Anovos feels like vac-formed plastic - much like the original screen-used helmets. So its not like we're looking at a ultra-detailed copy of the screen-used helmet - but price wise that's just not possible. However what we do have here is a decent looking replica of the above helmet from TFA - at a fairly reasonable price point. As mentioned earlier we're hearing that Anovos used a mould taken from one of the Rogue One helmets for their X-Wing range (not sure if physical or digital mould - but probably the latter). So this and the forthcoming Rogue One - General Merrick helmet both derive from the same moulds - with just the detailing and paint finish differing. We'll have the Merrick review when the helmets released over the next few months. It clearly is a nice paint job. Not sure these are detailed by robots or humans (armed with with some very good stencils) - but the overall finish is really cool. This particular helmet was sourced from a fellow collector (Thanks Rich!) 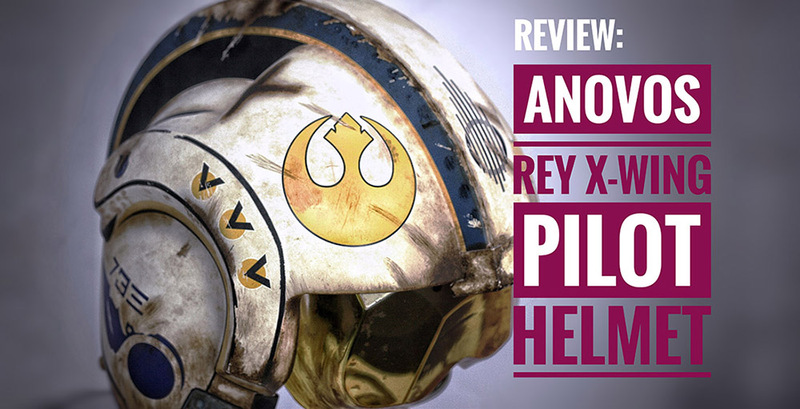 so as with all the Anovos helmets on review - we've not had a single ounce of help from Anovos - yeah thanks guys! Looks like a case of "X marks the spot" with the above shot - not sure what kind of weathering that's supposed to represent but we're assured its on the original so cant really complain! Again we've probably gone overboard with the photos but it is a really nice helmet to photograph - and Anovos has done a really good job in bringing a quality replica for a reasonable price. Remember the Anovos helmets aren't numbered - so there's no limit as to how many of them they will produce, although even at the $300-$400 price point it still a relatively small market, so unless they decide to flood the market its unlikely these will reduce in price over time. However the lack of the "limited" status seen from other License and Non-License holders - along with the lack of "display materials" like a stand and name plaque - does in our opinion hurt its collectability. The amber gold visor is bolted into place, so doesn't move. 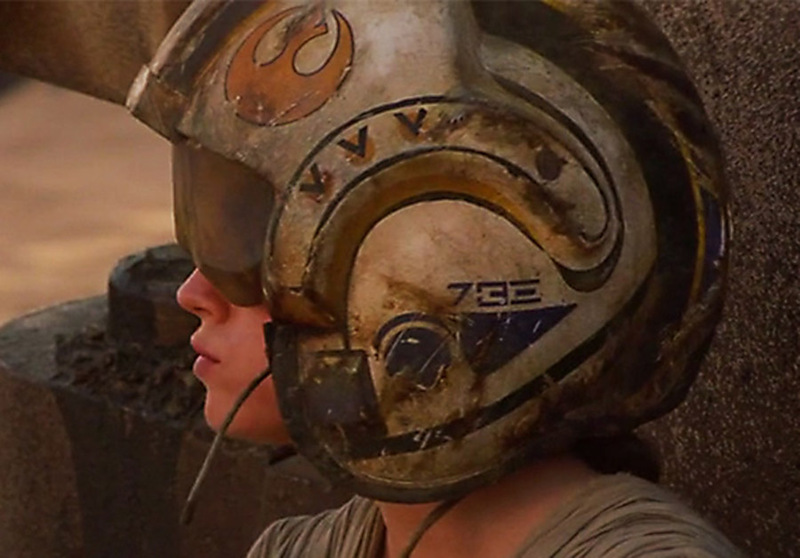 We don't see that as necessarily a problem with this helmet as there's no way to know that Rey's moved. However for the forthcoming General Merrick helmet (and subsequent Rogue One helmets we're sure will follow) - we are hoping that Anovos fins some way of allowing the visor to move up a down a tad. Like Rey's original this one also has the two flexible cabled mic/connectors which can pretty much be bent/positioned as necessary. Glancing inside its nicely furnished with faux black leather/cross stitched padding and separate Velcro pads (and ear donuts) which you can move around to your hearts desire. Certainly one of the most comfortable helmet we've worn and if it is part of a consuming ensemble then you'll have absolutely no problems walking around SDCC all day! Above a close up shot of some of the weathering. That area to the front of the Mohawk really has got some really cool "ground-in" looking detailing. When you look at this side by side to one of EFX's X-Wing helmets (see review here) you can see quite a noticeable difference in size. We've always though the EFX was over-sized (and certainly the measurements we have of original helmets reviewed here backs that up). As mentioned earlier the EFX on the left is made from fiberglass, whereas the Anovos is a vacuum-formed plastic/styrene of some description. Therefore detailing on the Anovos on things like the centre Mohawk strip is more accurate with the slight "stepping" of the centre strip (formed correctly on the Anovos by simply adding a centre strip of styrene from front to back - whereas the Fiberglass EFX has the stepping moulded into the design). So this is more of a reflection of the design choices EFX had to make when opting for Fiberglass. Both helmets have a slight overly curved line of the Mohawk when seen in profile - although to be fair given the Anovos is based around the ANH "prequel" Rogue One - it may well be that for that movie the prop guys cleaned up the helmet and make the curve more rounded. We clearly need to get our hands on one of the Rogue One originals! As you can see from this rear shot the over-sized EFX is actually quite a lot larger than the Anovos. Finally a front-on comparison for reference. Both great helmets - and certainly a the Anovos an excellent looking addition to any collection.